This is a companion card to this card as I made the pleats at the same time when my friend, Judy, visited. The fun pleat is super-easy to make! 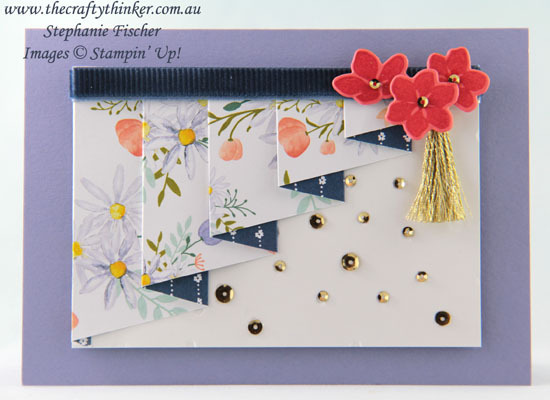 The base card is Wisteria Wonder to pick up the colour of the daisies in the Delightful Daisy Designer Series Paper and the Calypso Coral flowers pick up another of the colours in the paper while the Night of Navy Corduroy ribbon picks up the contrasting colour in the pleats. I decided this was an ideal opportunity to use one of those gorgeous tassels and echoed the gold with the use of the sequins.